It was a blast catching up with so many friends at the Percussive Arts Society International Convention in Indianapolis last month. Thanks to Neeraj Mehta for inviting me to be part of the World Percussion Panel Presentation and to Rick Kurasz for inviting me to perform with the PAS Mass Steel Band. Both events were stellar. The steel band was extra special as I was reunited with several fellow WVU pan players after 20 years and we were joined by PAS Hall of Fame inductee Andy Narell. Check out video footage of our full performance here! At Oakland University, we are wrapping up another successful semester this weekend with two terrific programs featuring my drum brother, Chinelo Amen-Ra. Chi and I first met many years ago when we were both students of the late, great Modibo Kieta, one of the finest drummers to ever come from Michigan. Modibo introduced me to African music and laid the foundation for all of my future studies of the continent’s extraordinary percussion traditions. Chinelo has truly followed in the footsteps of our master teacher and has become a master djembe and conga drummer in his own right. It is a great pleasure to welcome him to Oakland University as our guest artist! A full description of this Friday’s program can be found here. Then on Saturday, we have a special event in Pontiac as part of the OU/Pontiac Initiative. 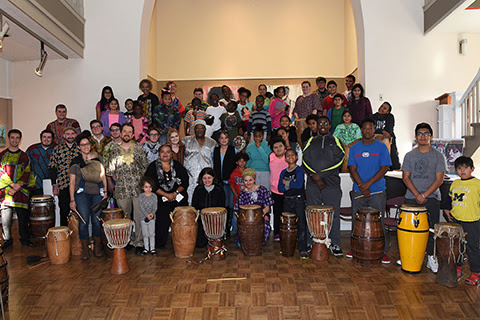 At 2pm, Chinelo and I will present a free workshop for all ages at the Pontiac Creative Arts Center followed by a 4pmperformance with the OU African Ensemble and World Percussion Ensemble. Event details here. Please spread the word about these events and I hope to see you there!